The syllable pattern in REVLOC is is a departure from the Vowel-Consontant-Vowel patterns. This one is Consonant+LE. It is the L in REVLOC. If you have not read the post on REVLOC, please read it and come back. When you have a word with a Consonant+LE at the end, count back three letters, then divide the word. Consontant + LE is ALWAYS at the end of the word. Within this syllable division type there are different kinds of words. One, when the middle consonant is doubled. Or, when there is a consonant you can hear. Or, when there is a ck inside the word. In this case, when dividing the word, you DO break up the CK. 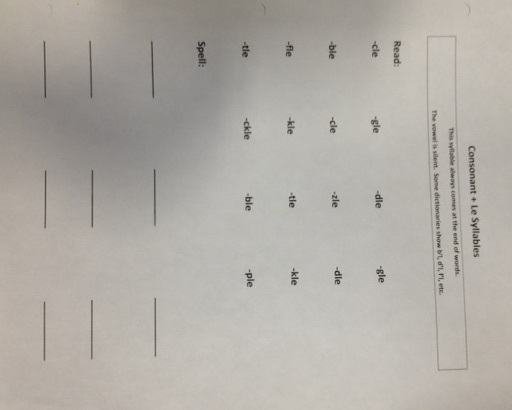 Here is a worksheet to try. It asks that the student write the sound of each Consonant + LE syllable just like the list I wrote above. Not sure why this is coming out sideways, but on my computer it is right side up. Please use your viewing program to turn it or comment to me to send it to you personally. OK. You know I love your blog. But I need some guidance. I homeschool. My oldest is on her way, doing great. I know what to do. My 7 year old seems to not get it. Could be age, but I also suspect some spelling challenges genetics from her Dad. I love this Orton Gillingham you are presenting. Is there a book I can follow/buy? Or can you suggest if there is an sequence order to your site–for example if I start back at the beginning of your archives, can I print your posts and use those as guidance for teaching. Any suggestions? She is an AWESOME decoder. She is very poor at encoding. I’ve used Explode the Code, Spelling Workout, Rod and Staff and worksheets I pull off the web to help.